Located on the cross section of Boston Avenue and Harvard Street, the landscape and renovated brick warehouse building serve as Tufts University’s East campus gateway. The renovated warehouse integrates engineering and arts facilities under one roof. The landscape was designed to introduce a variety of outdoor seating and and meeting places. The project is centered on new models of education both in and outside the building. It includes teaching labs, outdoor classroom space and a renovated carriage house courtyard cafe. Both the carriage house courtyard and the corner park will offer multiple opportunities for casual outdoor gathering. The landscape is intended to be a teaching and test lab for native and sustainable strategies. 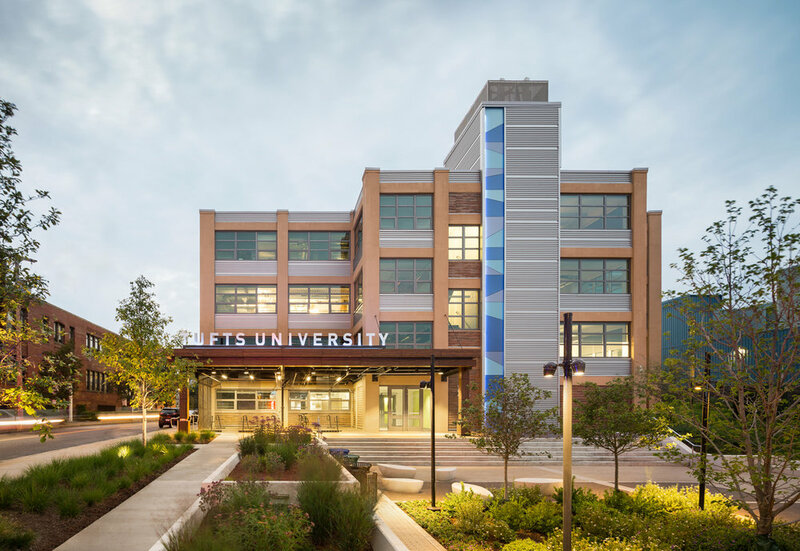 The design includes stormwater runoff reduction by employing pervious paving and a terraced rain garden featuring plant species with a range of tolerance to water inundation. The planting includes a number of test plots featuring less used native ground covers and herbaceous plants.Covered bicycle parking is accommodated in two locations on the site, helping to encourage alternative modes of transportation.